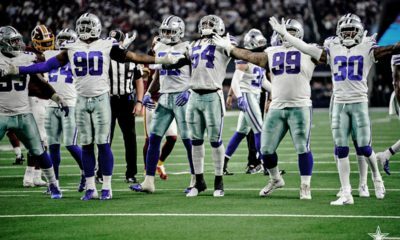 Tonight marks the second game of the preseason and its a little home cooking for the Boy’s back in the friendly confines of AT&T stadium going against Cincinnati. We must place a lot of emphasis on these games from an evaluation perspective. We had several players flash last week against SF. 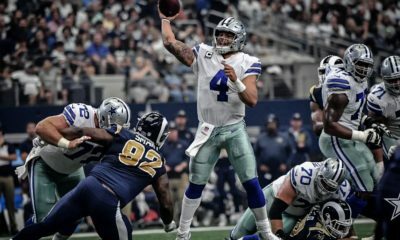 Key now, is can they bring it again and show consistency, one of the most important attributes for any NFL players and can they even kick up their performance another notch, showing a quicker reaction time and even better technique. Tonight’s game leads into next weeks “dress rehearsal” so its a huge night, bright lights on players fighting for a roster spot, practice team spots and at worst, good tape for other teams to evaluate. 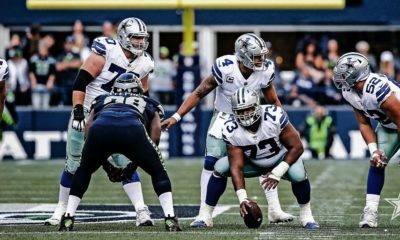 Don’t take these games lightly, they don’t count in the standings but having the best and most helpful players leads to wins or losses, so every snap is very important. One player that’s moved into the conversation as a starter that no one saw coming prior to camp would be, Antwan Woods. He’s been running with the 1’s at the 1 in Oxnard, filling a great need, since Maliek’s injury. 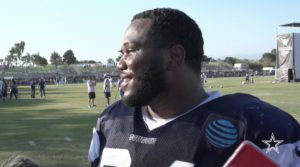 He had a solid week of practice in Oxnard, making tonight a big game for him to show that consistency needed to stay there and keep impressing the coaches. With each passing day, Jaylon Smith’s reportedly getting better by the moment. Playing faster, reading faster and using his patented swipe with greater frequency. There are high expectations long term for Michael Gallup, yet the word is that he’s regularly getting separation (huge) and being very smooth out there. We may be taking Connor Williams a little for granted but its a big night of learning and getting that consistency down for him as well. KVE, seems to be improving with each snap at LB and again the consistency of “getting it” and playing faster. Unfortunately, he may not see action tonight. Another player who impressed last week, who I’m expecting to have a solid game is Joe Thomas. Not a flashy name, but if you blink, he’s like a heat seeking missile out there. He impresses me a ton, with how he reads, plants and fires to the ball carrier. Really impressive burst. To me, he’s a lock to be on the 53/46 and may be a crucial player to fill in anywhere needed at LB’er, be it to give a guy a rest or fill in for an injury. Might be one of the best pick ups of the off season. The corners, outside of Chido & Byron, need to improve from the first game. Can’t put it any more plain than that. They have to play with better technique than we saw last week. Heath is expected to sit this one out with an injury, putting Kavon in a starting role, if his knee is good to go. Xavier Woods, hasn’t been making splash plays but when you’re the deep safety, often times, you won’t hear their name unless tragedy strikes. From what I’ve read, he’s played his assignments well, lining up his teammates well and not giving up big plays. Those are great attributes, the splash plays can come later. Another player with a great opportunity to showcase consistency is Lance Lenoir. All we’ve seen and heard is his making plays. Given those opportunities tonight, he’ll need to flash a play or two to keep his name at the forefront. I’m intrigued by McKay at WR, showed nicely last week and at 6′ 4″, a player to keep an eye on. Definitely on my PS at the moment as a developmental player. Two players I was counting on at the WR position to show me what they bring to the team, was Deonte Thompson & Noah Brown. Both have been injured and haven’t practiced yet, which makes them impossible to evaluate to this point. I was expecting one of the two of them to nab the 6th spot at WR. I admit I was pulling for Thompson with his speed, yet love the size of Brown too. But the 6th spot likely comes down to them and Lenoir. Can’t believe they’d go 7 deep on the outside. A position that gets little fanfare is at TE. After tonight, I’d like it to tell us how many players are likely to make the 53. Only one player seems to excite the fan base, that’s Rico Gathers. 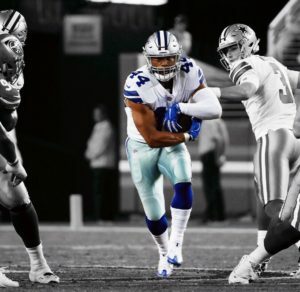 Easily the more freakish athlete of the bunch, but guys like Swaim, Jarwin & Schultz have all been playing the position daily for the last 10 years of their lives. Game comes naturally to them, while Rico’s been playing catch up with everything. Can they trust him to know and handle his assignments, down after down? Can he block the right man, at the right time, at the necessary angles? Has he done enough or anything substantial for the coaches to “trust” him? As much as I love his upside, they may not be able to take that risk in keeping him. Schultze has the pedigree for the position so I do see him making the 53, more for the future than the here and now. If he showed more in camp, I could see Jarwin being the odd man out. Big decision at TE to be made! 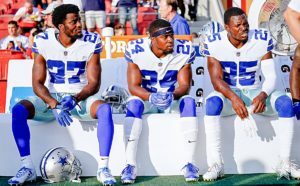 The backfield is solid right now with Zeke and Rod Smith at RB, with Olawale at FB. Probably can’t go with more than one more player from among, Darius Jackson, Scarborough or Trey Williams. The Alabama rookie draft pick has the edge after one game. Over on the defensive side of the ball, there are some interesting players to watch for tonight. 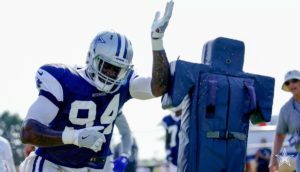 None more than #94, Randy Gregory, who tore it up this week in camp. In compete, he get the better of #77, Tyrun Smith on 2 of 3 snaps. That’s not done easily against the perennial all world, All Pro. Who’d believe it after being away from the game for 17-18 months? 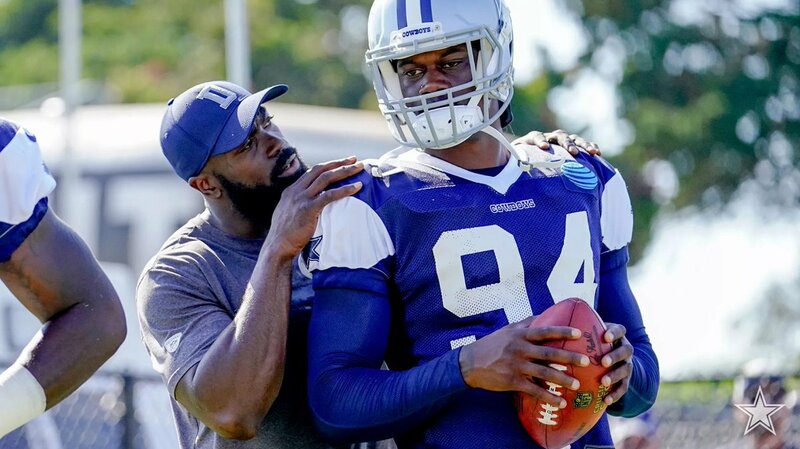 I don’t want to get too excited, but it could be special to see him show out with pressures or a sack in live full on action tonight. Its not confirmed that he’ll hit the field, but a wry smile when interviewed and asked if he gets snaps, seems to indicate there’s a good chance he gets some action. Dorrance Armstrong has been making his name known the last two weeks, so tonight is one of those opportunities to see how he does, the consistency he can bring. What Armstrong and Randy have that is so impressive is that they can bend like few others. I think Armstrong dipped so well on La’ell that he couldn’t get a hand on him the other day. To me, I want to rate the players against starters, not the 2’s, not the 3’s. Two players that we should watch up front as well are Taco & Tapper. Taco looked improved last week and faster than last season. Tapper, to me, can he stay healthy and show he’s worth taking the risk to keep him another season? I expected more from Kony Ealy, so IMO, times ticking for him. Jihad Ward, had some buzz when he came over, but that’s down to a whimper now, so time to shine under the lights or he’s on the street in a few weeks. Ditto’s for Datone Jones, another player with more expectations. At QB, Cooper Rush has the clear edge after last season and he played back to form in last weeks game to tighten his grip on the back up spot. For White, its now about showing that he’s worth keeping as the #3 or risking him on cut day and putting him on the PS. Need to see him with 1’s & 2’s to better evaluate as he wasn’t getting time to breath last week. Can’t judge players when the line play isn’t up to the task. 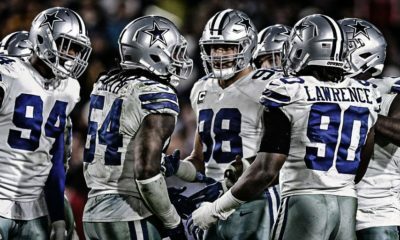 Let’s look for the players to show us consistency tonight, which means while making plays, they also need to be filling their assignments on a given play. Often its hard for us to evaluate that on TV for one and certainly not knowing their assignments we aren’t the best judges, but we can have a fair idea. Enjoy the game and check back in on Monday for my full breakdown of the game as I see it.